Cute face, spunky, sassy personality: One of Kill la Kill’s Elite 4 takes center stage. Finally, after many months of waiting, the “What’s in a Character” series returns, with a piece about…Nonon Jakuzure? Yes, it’s true that I wrote about Kill la Kill here, with no minced words, but I have my reasons for this highly unusual pick. She might not be the main draw of her home series, but she has a way of stealing the show on screen, whether it be through her devastating musical endeavors or just being the right mix of sass and cuteness…Without further ado…here’s Nonon! WARNING: Spoilers for Kill la Kill ahead. Choosing a character from an anime that I’ve made no bones about on its gratuitous fan-service might seem strange at first glance, but in reality, Kill la Kill does have some key aspects that work incredibly well in its favor. In particular, it has both superb character design and some pretty good character development, especially when it pertains to its key characters. While these discussions often revolve around Ryuko Matoi, the lead character, or her arch-rival/half-sister Satsuki Kiryuin, they less often fall on the latter’s faithful elite subordinates and commanders- the so-called Elite Four- and in conjunction with that, even less often on any of the individuals within that grouping. One such individual just so happens to be Nonon, and boy is she something else. Chosen as one of Satsuki’s elites, Nonon is definitively not meek. The defining trait of Kill la Kill’s indomitable band leader of doom is her unabashedly rude, pompous and overconfident front that she juxtaposes from a position of power, hidden under a thin layer of saccharine sweetness and inauspicious cuteness. While this alone does not make Nonon’s character worth writing about, the context in which she’s deployed does to a by and large extent- and so the question of “what happens when you throw this character into unexpected binds and insane situations?” unfolds dramatically in concert with Ryuko’s challenges of Honnouji Academy’s various clubs, inevitably leading into confrontation with Satsuki’s Elite Four. One of the truly remarkable aspects about Nonon as that she’s not a sympathetic character (at first) or even a protagonist archetype, but someone who is the right mix of sweet and sour who can become in equal part likable. There’s a clever juxtaposition of her musical motif- the band conductor- against her actual personality, which is far more spunky and not at all what you’d expect. She might like classical music, but her way of fighting is a punk rocker at heart under all the fancy trappings. 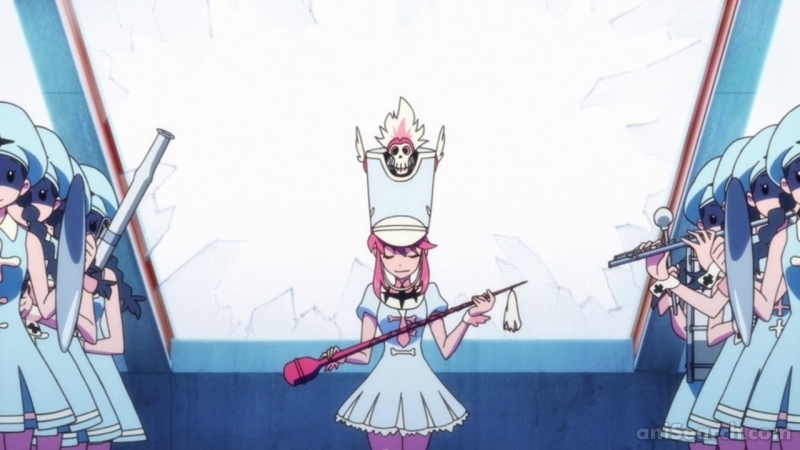 Physically, Nonon isn’t that impressive or crazily proportioned like some anime girls (including this series). She’s fairly petite, and has no defining physical features that would normally mark her as a key threat…but in a classic reversal of form, she might in fact be the nastiest and trickiest Elite Four member to fight- and her specially powered-up series of Goku Uniforms through the series emphasize a nice blending of her aforementioned motif along with disproportional power to her appearance. In battle, Nonon proves to be ruthless, overwhelming Ryuko for stretches in her initial uniform before ultimately tasting defeat after a fierce battle, overwhelmed by the power of Senketsu. However, in all her on-screen battle appearances, she never backs down from a challenge, suggesting a fair bit of courage despite the bravado and attitude she possesses. As adversity mounts for her and most of the main cast with the show’s second half, her mettle is tested along with the rest of her compatriots, especially the other Elite Four members, as the truth of Honnouji Academy’s purpose and the Life Fibers come to light, and the subsequent turn to join up with their former archenemy- Nudist Beach. Initially serving as a supporting antagonist, Nonon’s role shifts through the series while remaining steady in one key respect: as a loyal friend and subordinate to the aformentioned Satsuki, and while her loyalty is admirable, it borders on fanaticism. Her outsized sense of importance and rank meets some harsh reality as the show rolls on though, but admirably her bond with her boss/friend does not diminish. Nonon’s temperament becomes a bit more muted after the defeat of Satsuki by Ragyo Kiruin, the latter’s mother, and her own losses that she suffered to Ryuko (although the latter point also made her hungrier for personal vengeance that never totally came.) While she briefly enjoys a resurgence of success in the show’s “School Raids” arc, the total defeat and takeover of Honnouji changes her role and position. She becomes a rebel fighter along with the rest of the Elite Four in the eccentric Nudist Beach group- guerillas dedicated to destroying the alien Life Fibers that serve as the core plot point of Kill la Kill. Like what you see? Any further commentary on Kill la Kill or Nonon? Leave a comment!